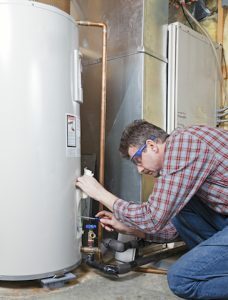 Your home’s hot water heater has a big job to do! Your home’s hot water heater has a big job to do! After all, it is responsible for heating water for your entire home at a moment’s notice so that you can take a shower, wash your hands, dishes, laundry, or anything else you may need hot water for. How does it do all of this? Here’s a brief guide to teach you a little more about the components of your hot water heater. When you look at your hot water heater you’ll probably just see the tank and thermostat (if you have a standard hot water heater), but your hot water heater has many components that help it to get the job done. Tank– the tank is the part you see. They are typically located in the basement or laundry room of a home. Most residential water heater tanks hold around 40 to 60 gallons at a time. They are heavily insulated to increase efficiency. Thermostat– as the name suggests, the thermostat controls the temperature of the water inside the tank. Once set to your desired temperature, the thermometer component of the thermostat will monitor the water temperature. Whenever it dips below where it should be, it triggers the heating mechanism to start heating more water. Heating mechanism– this is what actually heats the water. Different units have different heating mechanisms. Drain valve– Located on the outside of the tank near the bottom, the drain valve allows you to keep the pressure inside the tank at a safe level. Anode rod– Located inside the tank, this piece helps to keep your hot water heater from corroding. This entry was posted on Friday, March 16th, 2018 at 7:00 pm. Both comments and pings are currently closed.